The Green Bobcats defeated the East Tartans 16-8 in both teams opening game of SOC play. Mackie Kingery was one of several rushers for the Bobcat offense in their 16-8 victory over the East Tartans. In both teams opening game of SOC I play, the Green Bobcats defeated the East Tartans 16-8 in a hot and humid game in Franklin Furnace. The sun started to creep behind the western hills in the distance at about the same time as the game’s first score when Green running back Alec Smith took the ball 94 yards to the house, giving the Bobcats the 8-0 lead with 7:21 left in the first quarter after Lonnie Smith successfully converted the two point conversion attempt. That long run came after the Tartans fumbled the ball on the one yard line in the opening drive of Friday night’s contest. Turnovers would be an issue throughout the night as the humidity made the ball slippery for both rushing oriented offenses. The Tartans would make the game very interesting coming down the stretch as running back Kyle Flannery scored East’s first offensive touchdown of the season on a one yard touchdown rush with 4:16 left in the third quarter. Flannery also converted the Tartans two point conversion attempt, tying the game at 8-8. The touchdown was set up by a Green fumble on the goal line with 4:58 left in the third. 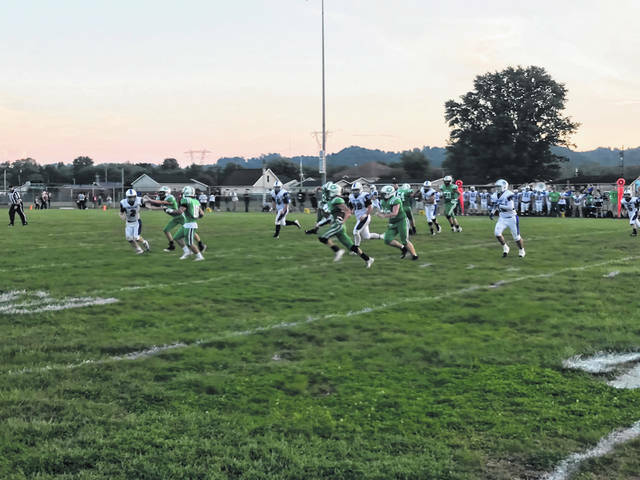 After the changing of possession for both sides, the Bobcats would ultimately make their game winning drive halfway through the fourth quarter. Quarterback Trevor Darnell kept the ball on the Bobcats 4th and 1 conversion for a 17 yard rush with 6:40 left in Friday night’s contest. Substituted fullback Rickie Nash made a huge two yard pickup for Green on a 3rd and 1 at the 11 yard line to give the Bobcats another drive extending first down. The very next play, Alec Smith once again found a hole in the Tartans defense and scampered in the end zone for the second time on the night, this time from nine yards out. “Their defense came out ready to play” said Smith following his two touchdown performance in their week two victory, 16-8, “I honestly didn’t expect them to come out and play like that. You could see in their defense that they really wanted to beat us. It was a tough battle for us, it was tough running the ball. I just had to keep my head up, and all thanks to my (offensive) line. I couldn’t have done it without them.” Smith converted their two point conversion attempt for the final score of the game, giving the Bobcats the 16-8 victory. Smith finished the game with fourteen carries, 170 yards, and two rushing touchdowns. The Tartans will travel to Manchester next week in search of their first victory of the 2018 season. 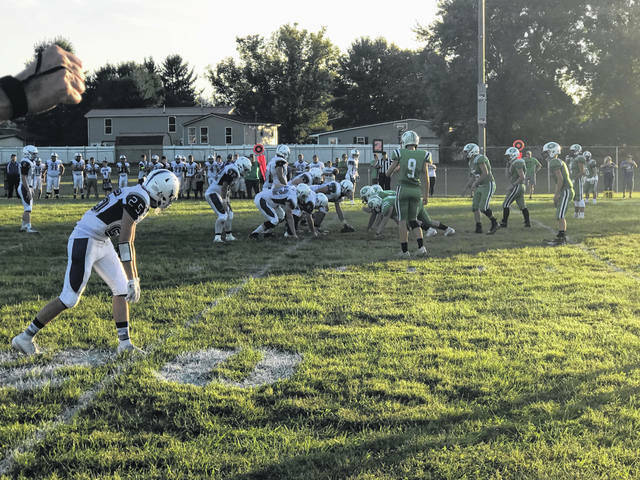 https://www.portsmouth-dailytimes.com/wp-content/uploads/sites/28/2018/09/web1_greeneast.jpegThe Green Bobcats defeated the East Tartans 16-8 in both teams opening game of SOC play. https://www.portsmouth-dailytimes.com/wp-content/uploads/sites/28/2018/09/web1_kingery.jpegMackie Kingery was one of several rushers for the Bobcat offense in their 16-8 victory over the East Tartans.